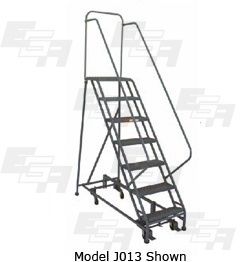 Rolling Ladder - Made in the USA | EGA Products, Inc.
An American made Rolling ladder from EGA Products provides easy portability in and around any workplace – big or small, fast or slow paced. No matter the access need, EGA Products’ catalog can be customized to meet and exceed expectations. The first step in the process is to define the access required. 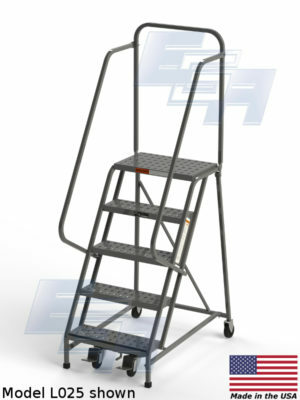 Know your space and your needs, then select the ladder that best suits those needs. The rule of thumb here is to have the top platform come within 5 feet of the highest required access point. A free consultation from EGA Products is a great option to define this need. Please, don’t hesitate to reach out! Figure out the width that works best for your space. Usually, there needs to be sufficient space to pass the ladder. That said, the more extensive the ladder width, the better, as the width helps reduce any minor lateral motion from diverse work conditions. Again, a consultation is a good bet for this step as well. Decide if the ladder needs to go through doorways or make tight corners. While often overlooked, this aspect may be the most critical element in determining which ladder is ideal. Consider safety at all times. Rolling ladders are inherently more reliable and sturdy than free-standing extension ladders, but be sure to read up on ladder safety when choosing a ladder. Please scroll for the basics in rolling ladder safety. EGA has a staff of engineering and design professionals that can work with you to define needs and work through possible customization options to meet the needs of the job duties. 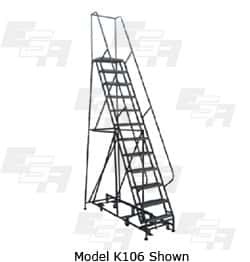 Have a look at an extensive selection of Maintenance, Stock Picking, Aluminum, Office, and Folding Ladders. Or, if all that’s needed is something to repair an existing ladder, check out replacement parts and accessories. Need more help finding the right ladder? Read our complete guide on how to choose a ladder. If you have any questions, please do not hesitate to contact us. 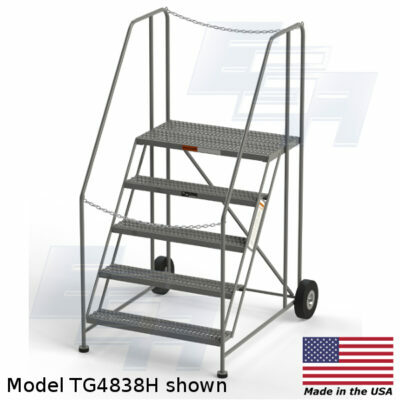 The safest warehouse ladders get made in the USA – from the ground to the top step platform. 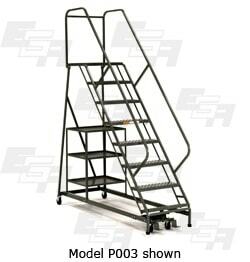 EGA Products offers over 360 commercial steps that are made right here in the USA. EGA’s products are designed and built to meet and exceed industry standards for quality, reliability, and performance. 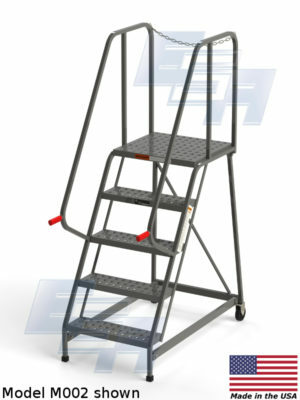 EGA plans OSHA-compliant ladders that cater to the needs of any business. Clients range from all kinds of retail, manufacturing, and warehouse shipping/storage. EGA Products are designed to make access to valuable assets safe and secure. 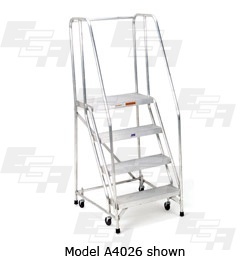 Safety standards, coupled with American craftsmanship, gives EGA customers a long-term material handling solution. 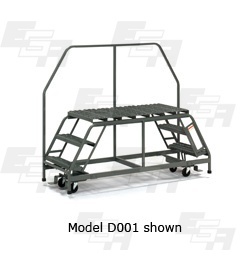 EGA designs and builds everything from rolling step ladders to massive ladders capable of reaching the highest shelf in the biggest warehouses. At EGA Products, hiring the best welders, machinists, and skilled tradesmen have paid off. In a world dominated by importers, EGA has held its own because it doubled down on a strategy to offer entirely American Made material handling goods. Why? It matters to EGA, and it matters even more to their customers. Clients of EGA know they’re buying handcrafted products they can count on because at EGA having an eye for craftsmanship is why we’re still here today. EGA’s industrial stairs get built from metals like aluminum or steel, while also including Grip Strut®, EZY tread, or rubber platform step treads that provide a stable, walkable surface. EGA also offers custom engineered solutions based on client requirements or work conditions that stipulate needs beyond the current EGA catalog. The beauty of a full-service design and manufacturing facilities here in the United States comes from the one-off adaptability of design and construction – will no pitfalls in safety or durability. Here are some tips and friendly reminders to be safe with your material handling equipment. A ladder is only as good as its operator – practice safe ladder usage. Be smart! Pick the right ladder for the job. Choose to use the best possible ladder for the job required. Portable warehouse equipment is incredibly helpful; however, when misused, they can lead to a preventable outcome. Construction details like step width, the height of the platform, and the slope angle of the steps. A steeper climb usually means the operator must face the ladder while going up and down. Train the team. Also in 29 CFR, there’s a lengthy description of ladder usage (request a free EGA usage poster). 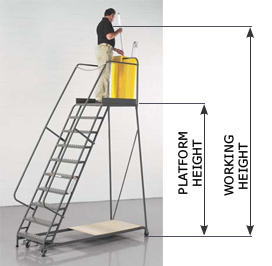 The first rule of ladder usage is the three-point rule – keep three points of contact on the ladder at all times. Heavy objects should be team lifted, not carried up the ladder. The bulk of ladder injuries happen while objects and packages get transported up and down steps/rungs. Check out the ladder usage app from NIOSH for mobile access to user assistance. This concept may seem like a no-brainer, but training should happen before use. Keep up with maintenance. Keep the unit clean, so it isn’t able to corrode. Use recommend replacement parts if and when necessary. Of course, don’t misuse the ladder. 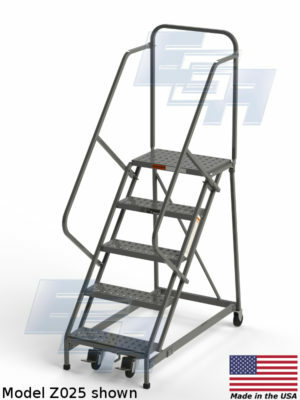 Examples include storing items on the ladder and refrain from putting unnecessary or unintended loads onto the ladder. For more on ladder usage, reach out to our expert team. We’ll hook you up with a poster you can hang on the wall, and we’ll answer any questions that you may have. Happy climbing! 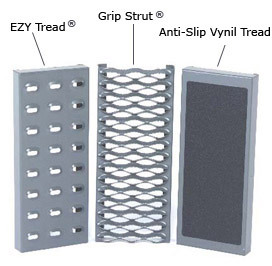 EZY TREAD – Items made with perforated EZY Tread ® are designed to provide just enough grip to lock the foot in place, while still allowing the autonomy to work freely. 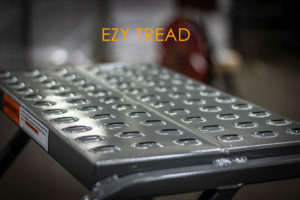 EZY Tread won’t wear down like the completion’s imported rubber-like material, and it performs well in concert with a multitude of work footwear. 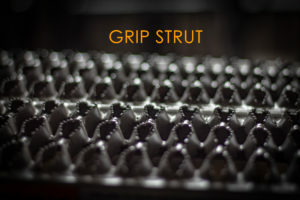 GRIP STRUT TREAD – Grip Strut Step Tread is a patented technology for safety grating that’s durable, and has rust-resisting properties. Standard mill-galvanized finish prevents corrosion for a long lasting surface. The serrated surface can grip boot/shoe soles securely in all directions. The open design makes it easier to clean, and the non-slip patented technology is perfect for inside or outside, where a multitude of hazards can otherwise cause dangerous work conditions. RUBBER TREAD – Not all rubber is made equal. 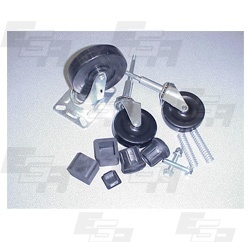 Lesser rubber materials will crack and crumble after short-term use. 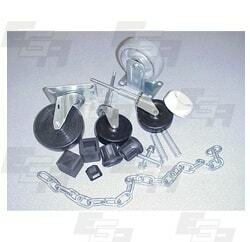 EGA builds products for long-term use, so the use of a flimsy rubber wouldn’t make sense. Designed to stick outsoles for safe usage, EGA’S rubber step tread is the industry standard bearer. 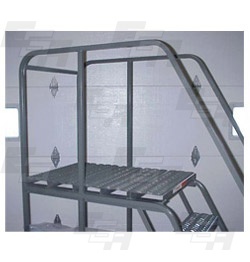 Finally, a ladder that provides secure access to semi- trailers when docking bays are full or unavailable. Ideal for retail and stand alone facilities. This ladder offers the "trailer jumpers" an alternative. 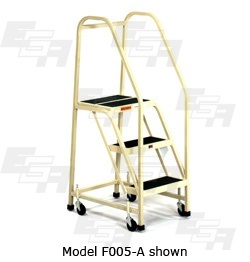 EGA multi-directional rolling ladders have four swivel casters which allows precision steering - enabling easier positioning of ladder in tight areas. 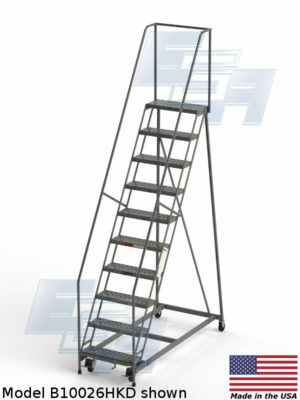 Double Ezy-Lock mechanism easily lifts ladder to the rolling position. 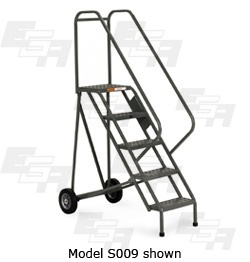 EGA 360 degree rotating rolling ladders are the perfect solution for tight warehouse aisles. These ladders can spin on their own axis while still being able to track in a straight line.